Eddie Stinson and Benjamin D. Foulois - 1916 This picture was taken in 1916 in San Antonio Texas. Foulois, (right), was a Captain at the time. Stinson, (left), was killed in a crash in Chicago, Ill, 1932 in a Stinson Airplane. 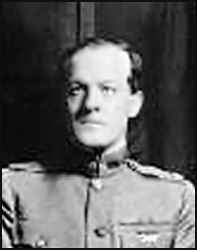 Foulois, later a brigadier general, recalled that when he was ordered to Fort Sam Houston, Texas, with Signal Corps aeroplane No. 1 to teach himself to fly, he was admonished to take along "plenty of spare parts." On that machine he had his first solo flight, first takeoff, first landing and first crackup---thereafter receiving instruction from the Wright brothers by mail whenever he needed advice on some as yet obscure aspect of becoming a pilot. This premier military plane remained in active service until 1911; it now shares honors with other early aircraft in the National Air and Space Museum in Washington. A plaque on the parade ground at Fort Meyer commemorates the 1909 trials. Pancho Villa and the Early Birds In the early morning hours of March 9, 1916, Pancho Villa's guerrillas swept across the border and sacked the little town of Columbus, NM. Although the raid was small compared to the sneak attack on Pearl Harbor, it holds a special significance in the annals of the American defense establishment. 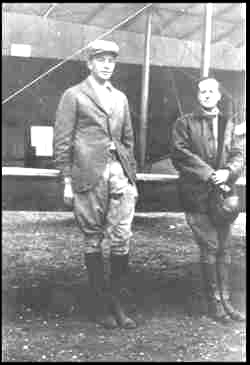 Foulois had 10 other aviators with him, including two who also became members of the Early Birds, Herbert Dargue and Edgar Gorrell. They first flew Curtiss JN3s, actually modified NJ2s, then Curtiss N-8s and finally Curtiss R-2s. None proved suited to military operations in the arid southwest, however. While the exercise appeared to be a disaster in one sense, it marked a turning point in military aviation. It was the first time ever that an American tactical air unit would be tested in the field under combat conditions. 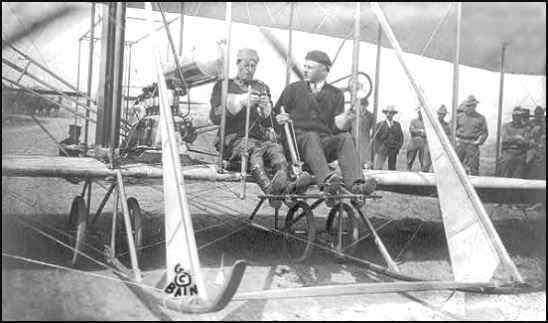 The 1st Aero, then the Army Signal Corps' only flying arm, flew hundreds of reconnaissance, photo and courier missions. And when it ended, Benny had demonstrated that the airplane was no longer an experiment or novelty, but a practical tool with many use military applications. Each year Columbus commemorates the battle. This year they invited me to speak. It gave me the chance to set the record straight in several areas. I focused on the fact that Columbus is undeniably the cradle of military aviation. The effective air strikes in World War II, Korea, Vietnam and Desert Storm can trace their roots back to Columbus. It is there that the U.S. Air Force we know today had its earliest operational beginnings. I also pointed out that in the judgement of some historians, Benny Foulois was one of the most under-rated individuals ever to command the U.S. Army Air Service (later Air Corps). 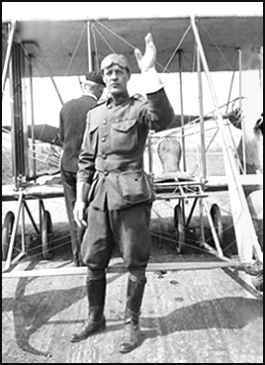 Foulois first envisioned the concept of military airpower when he was the Army's only aviator, long before Billy Mitchell had even learned to fly. And it was Foulois and Gorrell who came up with the idea of strategic bombardment, not Mitchell. Frequently those who write history alter it at the expense of those who made it. We won't let that happen when the story of the original Early Birds is finally told in book form. mainly in respect to its own deficiencies. The worried young pilot flew south, deeper into hostile territory, navigating by the stars. Below the fabric-covered wings of his Curtiss JN-3 "Jenny" darkness had already obscured the unfamiliar landscape of northern Mexico. Lieutenant Edgar S. Gorrell had never flown at night before, and his engine was overheating. The flight had been jinxed from the start. 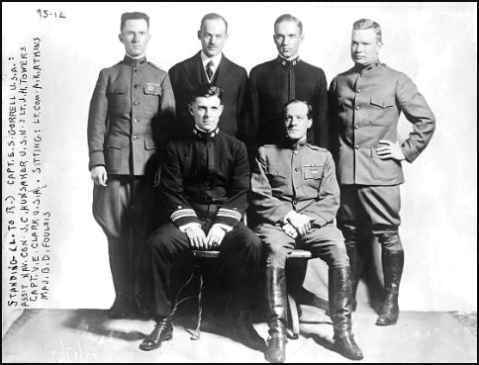 Pre-flight preparations consumed more time than expected, so the eight planes of the 1st Aero Squadron had not taken off until late in the afternoon on March 19, 1916. Not long after they flew south from Columbus, New Mexico, Lieutenant Walter G. Kilner had turned back with engine problems. Navigation errors contributed to the squadron's problems. Each plane carried a different type of compass, and the aviators were equipped with poor maps. Only one flier, Lieutenant Townsend F. Dodd, had ever made a night flight before. These lead paragraphs were excerpted from the article "1st Aero Squadron" which I found by doing a search on the net for "Edgar S. Gorrell." You will find a short summary of Gorrell's role in the Mexican expedition as well as a link to the full text of the article from the AVIATION HISTORY magazine. In the full length article, which is a fascinating story of the Punitive Expedition into Mexico in 1916, you will find references to many other Early Birds including, Joseph Carberry, Carleton Chapman, Glenn Curtiss, Herbert Dargue, Benjamin Foulois, Edgar Gorrell, Walter Kilner, Ira Rader and Ralph Royce. If you are interested in this event, or in stories from the history of aviation in general, I highly recommend this website and magazine to your attention. WRIGHT 1909 MILITARY FLYER You will find a large photo of the plane and a nice story on the plane and Lt. Foulois on the US Air Force Museum website. You can visit that reference by clicking on the title above. If time permits, I heartily recommend that you visit the homepage and plan to spend some time on this wonderful site. of the Society in 1962. You may want to use the "Find" function on "Foulois"
Harold and many other Early Birds are mentioned in this story. EB Chirp North American Aviation, Inc.